I’ve been rummaging around in some old papers and old photo albums today, and I came across some souvenirs and a short diary I wrote on my second Student Exchange trip to Germany in 1993. 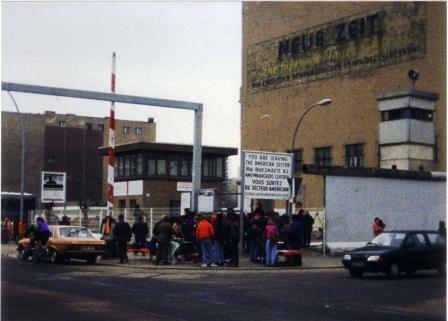 The first exchange I went on was to Hannover in 1991 and the second was to Berlin. These were two very interesting experiences. I was 15 years old on the first and a couple of months short of turning 17 on the second. 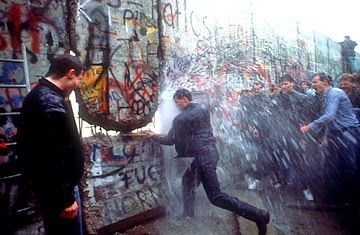 The Berlin Wall had come down in November 1989, so Germany was a very vibrant and buzzing place to be at that time. 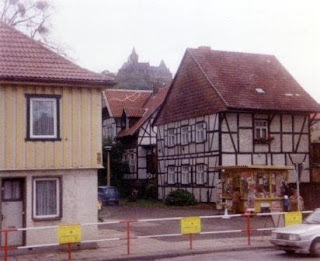 I was very fortunate to glimpse the changes from both perspectives as I stayed with a West German family in Hannover and then an East German family in Berlin. The insights I gained from each trip were a real eye-opener. I learnt that not everything was as simple and as easily explainable as the News Media back at home had seemed to suggest. I remember I kept a diary of my trip to Hannover too, but this now appears to be lost. I may well have thrown it away as I seem to recall I wrote parts of it in my hopelessly obscure pidgin German which may well have become mystifyingly untranslatable with the passage of time! 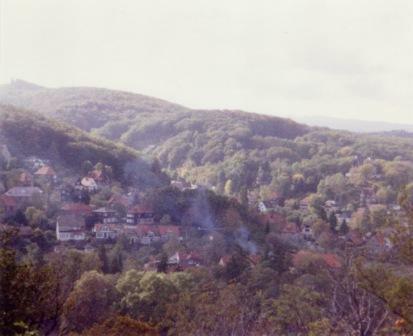 But the two parts of this first trip which stick most vividly in my mind were two day trips we made, one to Bergen-Belsen, and the other to the small East German town of Wernigerode. I make mention of both these day trips in my East Berlin Diary, firstly because we made a similar trip to Sachsenhausen, and, secondly, by bizarre coincidence I found out that my second exchange partner’s parents had married in Wernigerode Town Hall (they were amazed that I’d visited such a small place, especially so soon after the fall of the Wall). Sadly I have relatively few photos of these two trips. At the time I had only a small and very simple Kodak camera and perhaps only one 24 frame roll of 110 film per trip, the results of which – twenty years later – are now satisfyingly grainy looking photos! 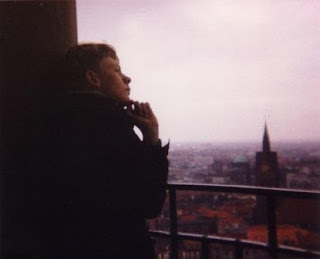 The following edited extracts are from my East Berlin Diary. It’s interesting to see what my 16 year old self thought at the time. Clearly Trabants were a big part of the trip for me. 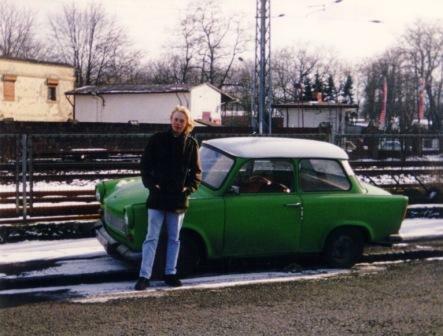 Times were changing fast back then – I remember seeing many more Trabants roaring around in Wernigerode in 1991 than we did in Berlin in 1993. I bet they’ve all long since vanished from the streets. Oddly enough I occasionally see an old Trabant parked in a little backstreet near where I work in London. Seeing it the other day took my mind back to these two student exchange trips. 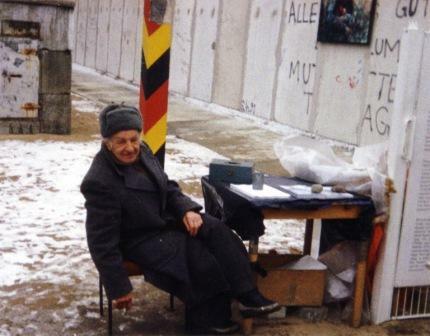 Both hard and not so hard to believe it was twenty-odd years ago, I wonder what I’d make of Berlin now if I revisited? – I’ve not been back since then. I’m sure it must have changed a lot. Saturday. 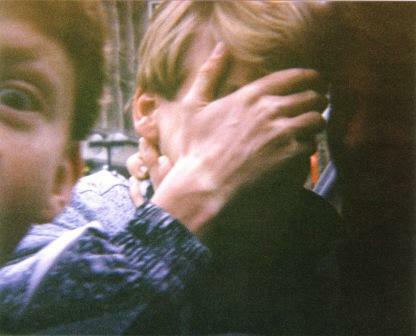 February 20, 1993. East Berlin. It was a very short flight out, and consequently it felt like quite an abrupt arrival here in Berlin (on the exchange to Hannover in 1991 we’d travelled out overland by coach). We landed at Tegel Airport in former West Berlin. All our exchange partners were there to meet us. Frank was there with his Mother. As we drove back to Frank's place I asked them to let me know when we passed over the former border into East Berlin. I didn’t have to wait long. We were driving down a smooth road when all of a sudden the road surface changed to cobbles and the car was bumping along noisily. Frank’s Mother lent over and said: “We’ve just crossed over into the East!” A short while later she stopped the car to show me the prison where Erich Honecker was held. Back at Frank's we had a quick dinner. Frank's family live in a very small flat in a suburb full of identical blocks. We then went straight out … to see what Berlin nightlife is like. We met up with some of the others and went on to a rock gig which was taking place (illegally) in a big, dilapidated, bombed-out-looking old building. The place looked like it hadn’t changed since Berlin fell to the Soviets! The music was quite loud, we hoped the place wouldn’t collapse on us. It was quite crowded too. After a few sets we left and went on to a nearby bar which again matched that decadent old Bohemian image of Berlin, as the place was full of flamboyantly dressed transvestites. We had some tall glasses of wheat beer. The weather in Berlin is extremely cold, much colder than London. [My friend’s] exchange partner, teased me saying that we’d brought the bad weather with us from rainy old London! But the rain was more like ice sleet. By the time we got back to Frank’s place it was 3am and there was plenty of snow on the ground. I was completely soaked and felt absolutely dead tired. Today was a long day, spent entirely with Frank and his family … We visited most of the major sights of Berlin – the Brandenburg Gate, what's left of the Wall and Check Point Charlie. It's amazing the Berliners now all just whiz across what was once Check Point Charlie without a change in gear. There’s a small Museum about the Wall a couple of yards away ... Here they currently have on display the huge Russian “Freedom” flag that was paraded in the streets of Moscow when the Soviet regime collapsed. You could actually touch it, the label said it was now travelling on a tour of Europe to promote peace in the new era. There was also an old box file on display that had come from an office on the West side of the Wall. It still had a bullet lodged in its spine which had been shot by an East German Border Guard when an East Berliner had tried to make a dash over the Wall. 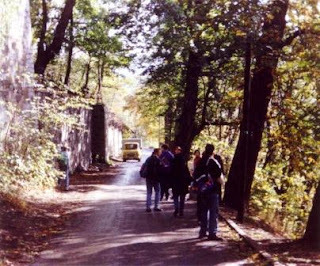 There were lots of photos documenting the history of the Wall and all of the escapes and attempted escapes. After the Museum we went to a café on the corner on the opposite side of Friedrichstrasse. Berlin looks just like it does in Cold War spy movies. The architecture on the East side is all very grey and communist looking. There are giant ducts, just like the ones in Terry Gilliam’s movie “Brazil”, running along the sides of the streets, bending up and disappearing into the sides of giant grey, box-like blocks of flats. The snow is now thick on the ground which only adds to the general John Le Carré-like atmosphere. I get the impression that [my exchange partner’s family] were very happy in the GDR. … They used to have a Trabant but now they have two cars, a Citroen and a Honda. Frank says that although they now have more freedom in terms of what they can buy and because they can now travel abroad, life in the GDR was much more certain. Frank says he was assured of a job for life when he left school under the GDR, now though that kind of thing has become much less certain. Today we went to our exchange partners’ school. I attended three lessons with Frank – English and double History. Their History lesson was about the Second World War. Frank explained that their teacher was talking about Nazi propaganda and showed us the chapter they were discussing in his textbook which had pictures of propaganda posters that showed Nazis fancifully marching through a conquered London. Most of Frank’s classmates seemed to find this hilarious seeing that we were sitting there. I’m not sure their teacher had fully thought this lesson through as she was having some trouble contending with their unruly behaviour. My being English was one thing, but I don’t know if their teacher had any idea that [my fellow classmate] is Polish (her family defected to England only a few years before the fall of Communism). In the afternoon we visited the Fernsehturm (TV Tower), where we drank beer in the revolving restaurant. After this we wandered round some old churches, before going to the Unter den Linden and the Brandenburg Gate. I think the success of an exchange depends on your tolerance of the other and vice versa. Frank has explained to me why there are so many broken Trabants littering the streets. Apparently it’s an old GDR tradition. If a Trabbi breaks down and it can't be mended or the owner cannot afford to move or mend it – they leave it. They do this so that other people can come and strip things from them for free instead of buying the parts. No one is supposed to do this but it’s become a kind of unspoken custom. The Police eventually move the dead Trabants after two weeks and give the owners a nominal fine. The authorities have tended to turn a blind eye perhaps because it was seen to be quite an altruistic practice, genuine communism, helping out those who don’t have enough cash to fix their own Trabants. Since the Wall fell the Trabbis are no longer seen as particularly safe so eventually, as the East westernises more, it’s likely that they’ll disappear forever. Frank’s family got rid of their Trabant in 1990. Today we took the train to Wittenberg. I’d been looking forward to this part of the trip having learnt all about Martin Luther and Wittenberg watching John Romer’s 'Testament' documentary. Travelling down from Berlin [we] stood for a while in the corridor of the railway carriage to watch the snow filled fields passing by outside. Soon after we pulled out of the station on our way back to Berlin the train steward turned up, we thought he wanted to check our tickets but instead he kicked us out of what we discovered was his private compartment. Now that the train was underway we had to walk the length of the train to find another compartment with enough room for all of us to fit in. Arriving back in Berlin we met up again with our exchange partners and went out for the evening. We didn’t really know where we were going but when we got there it turned out to be a church youth group. Not quite what we’d bargained for. It soon became clear that this was to be a full on God Squad affair. Everyone singing hymns and playing happy-clappy games. (This must have been the kind of religious gathering that was banned under the GDR. The fact that it was being held in a basement only enhanced the feeling that the Stasi would be hammering on the door shortly). We swiftly made some very crap excuses, to which the group leader said: "Ich glaube ... NICHT!!" (Wayne's World style), and [then we] left. Having made our escape we went to a bar – all brass, dark wood and velvet curtains, again a place with that strange out of time pre-war-feel which still clearly seems to characterise the eastern side of Berlin. It’s kind of spooky, but I quite like it. Today, we spent the morning watching lessons in a Realschule. 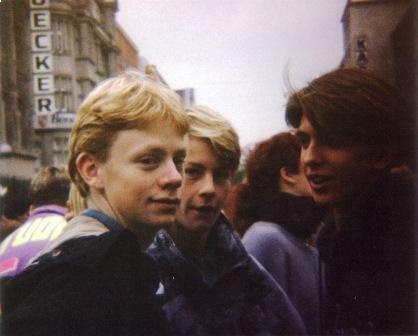 Es war sehr langweilig – although it did make me wonder how I would have fared at school had I been born here in Germany. The education system in this country is very different to England. For whilst literature and history have always been my main interests, my failings in most other areas probably would have steered me well clear of any path which would lead in such a direction. I’d probably have been destined for a life working on the assembly line of a Trabant factory (which might not have been so bad if they gave out company cars!). Visited the Check Point Charlie Museum again, this time with [my fellow college] students. Parked outside there was a Trabant which had been given a paint job like the Trabants on the album cover of U2’s “Achtung Baby”. It was for sale. I couldn’t believe how cheap it was. It cost near enough the same amount of Deutsche Marks spending money as I had brought with me [for the entire trip]. I pointed this out to [one of my friends]. “How would you get it back to England?” she asked. I imagined myself driving it to College. Nothing could be more cool than owning a U2 Trabant! In many ways East Berlin has been just as we’d expected it to be. East Berliners … all seem very serious ... There still isn’t much in the way of advertising billboards and such, and what there is seems old and dated even though it’s clearly only appeared since the Wall came down. There are lots of large open spaces, like Alexanderplatz, and there are next to no trees. We’ve been told that the last two are our fault (or rather Bomber Harris’s) for flattening the place during the Second World War, but I’d venture that the Communists who followed didn’t do much to remedy this situation! It’s interesting to hear though how a lot of East Berliners seem to tell a different tale to the story we’ve been told on all our news reports over the last few years. It seems like a lot of them miss the GDR and would prefer it if East Germany still existed. Several of the East Germans I spoke to have said that they only wanted the old system to relax its rules a little, to let them travel and buy western goods, otherwise they’d be happy to still have the same Government and the same prospects for their own personal futures that they had before. I told Frank how I’d seen a huge train loaded full of tanks, big field guns and other military hardware wrapped up in tarpaulins rolling slowly through a deserted station somewhere outside Hannover in the early hours of the morning. I’d asked my exchange partner at the time what it was all for and he’d said it was nothing – it happened most nights: “It’s just the West German Army moving into East Germany” he’d said. This clearly shocked Frank and it made me realise that the West had simply taken advantage of the collapse of the GDR’s corrupt elite. ‘Glasnost’ and ‘Perestroika’ had changed everything. The Kremlin was no longer there to keep things in line, so the West just quietly strolled into the empty space and reunified Germany. No wonder the West talks about finally having “won” the Cold War. Staying here in the former East Germany has spun a different perspective on that spirit of “The Wind of Change” which we’d all been joyfully singing about in Hannover in 1991. Writing this I am crouched at the corner of one of the original buildings in the concentration camp of Sachsenhausen. This place is very upsetting; more so than Belsen, even though it’s much smaller. This place is beyond words. Sachsenhausen is a grimly shocking place. Seeing it in the deep snow added an extra chill. Most of the buildings are gone. There’s a memorial with a tall obelisk pointing to the sky. One of the few buildings that have been left standing is what was called the Pathology Department. Here the “Doctors” performed twisted experiments with various strains of diseases, as well as using human skin to make lampshades and book bindings. There are two white tiled tables with drainage holes for [operating on] human bodies. There’s a basement below where they’d dump the bodies before disposing of them, a wooden bier still stands down there. In the far corner of the camp stands a set of ovens for cremating the bodies of prisoners, the brick work is now crumbling and the iron doors are rusting. Not far from the ovens is a wood lined pit where prisoners were executed by firing squad. The wall behind [the spot] where the prisoners were made to stand is made of logs laid end on in order to catch and deaden the bullets. This camp was mainly for political prisoners. Here the Nazis also used the prisoners to run a huge counterfeiting operation. At the end of the War the Allies found stacks of forged banknotes, English Pounds and American Dollars. * Sachsenhausen was in the Soviet sector. After the War the camp remained a prison, part of the Soviet prison system, until the 1950s. At the site of Belsen all the camp buildings have been levelled. All that remains are landscaped mass burial mounds with stone inscriptions that say “Hier ruhen …” – here lie, rather than, here rest … – so many thousand bodies. The site has become once more a part of the Luneberger Heath. The rumbling boom of artillery guns from the nearby British Military base unsettled the already eerie feel of the place. But Sachsenhausen is a profoundly more disturbing place. It’s so small. Still surrounded by a residential area – just as it was during the War – and yet, hidden just a stone’s throw behind its fence, was such deep depravity. It is incomprehensible. I’ve not visited Auschwitz, but I have seen the film ‘Shoah’ [by Claude Lanzmann]. If this is Sachsenhausen, Auschwitz must be overwhelming. It should be a part of everyone’s education to visit these places and know what happened here. [Richard Dimbleby's BBC Radio reports from the liberation of Belsen in 1945: Part 1 & Part 2. British Pathé newsreel footage of Belsen after its liberation in 1945. A short documentary on Sachsenhausen and its place in the events of the Second World War: Part 1 & Part 2. Warning: Some of the images accompanying all five features are unsettling. Alles Fertig. Wir fahre nach London mit einem Flug [sic]. (We are flying over the sea now.) Last night Frank and I went over to Franka's flat [a fellow classmate’s exchange partner]. Here we met some friends of Franka’s brother who own a Trabant. [We] squeezed into the back and they took us for a ride around the icy streets ... It was quite an experience, neither the driver nor his girlfriend spoke any English and he hammered the Trabbi for all its life. The car seemed to roar like a tiny tank taking corners with an almost perfect right angle. They are about the size of a Mini but feel much more cramped inside. I’ve never experienced anything quite like it, it was fantastic – good fun! Afterwards Frank and I went back to his flat for a final dinner with his Mum, Dad and younger Sister. It was the most talkative time I've had with them. Frank's Dad showed me their family photo albums. They were filled with black and white photos of Frank and his Sister on holiday, they looked as though they were from another era altogether! ... By a strange coincidence I discovered that Frank's Mum and Dad were married in Wernigerode Town Hall. They couldn’t believe I’d heard of it and were even more amazed when I told them that I’d actually visited Wernigerode in 1991. Whilst we were looking through their photos Frank disappeared and when he returned he’d dug out an old toy car of his which he presented to me as a souvenir – it was a light blue Trabant, just like the one in which [we] had thundered around [Berlin only] a few hours before.